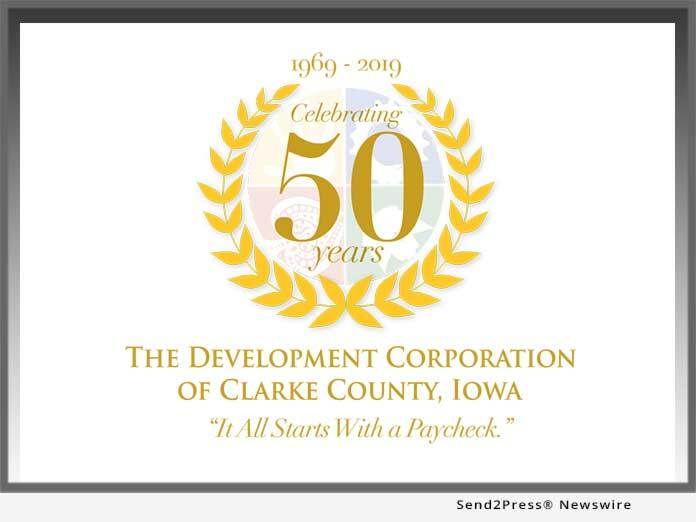 OSCEOLA, Iowa, Jan 30, 2019 (SEND2PRESS NEWSWIRE) -- This year marks the 50th anniversary of the founding of the Clarke County Development Corporation (CCDC). In August of 1969, the development corporation that has brought Osceola and Clarke County, Iowa numerous business and economic successes including Jimmy Dean and Hormel as well as the boon of Lakeside Casino all started from the passion of a few locals ready to push the community they loved toward a brighter future. The original founders and board members included Eddy Saylor, Fred Wood, L.P. Van Werden, Jack Jeffreys, Ross Gould, Stan Samuelson, Gerald Edwards, and Donald Ramsey. These founders developed a plan that would form an economic development corporation focused on attracting new business, supporting existing area business, and improving the quality of live for the entire community. Making sure to build the corporation on a not-for-profit, 501(c)(6) structure meant the corporation, with a board of directors made up of active local businesses and citizens, would work together to drive local and regional economic growth. The elected board would operate on behalf of the existing business and community members maintaining accountability to its core values, the members and the community. This structure has been at the core of its operations since its founding. "A lot can happen over five decades," said Bill Trickey, CCDC Executive Director. "When you have a board and membership as consistently driven for success and growth as we've had with the CCDC, what transpires is economic sustainability." Right out of the gate, the CCDC board took action to purchase and break ground for development of an 87-acre industrial business park on the south side of the city. Over the next decade, the board recruited businesses such as Osceola State Bank, Metal Craft Engineering (Now SIMCO Drilling Rigs & Equipment, Inc.), and Jimmy Dean Meat Company as the first tenants. Throughout the 70's and early 80's additional businesses moved in and the necessary infrastructure was developed made up of a water tower and another 68 acres with sewer and street construction. Today many of Clarke County's anchor employers like Altec (originally Furnas and then Astoria), Salford Manufacturing (previously Maclander), Osceola Foods (Hormel) and SIMCO do business from this park, serving customers all over the world. Understanding the logistical blessings of Osceola, Iowa - placed at the intersection of I-35, Highway 34 and Highway 69, as well as a local stop to the BNSF Railway - made the addition of an airport and improvements to interstate access a logical next step in drawing more business and industry to the area. The CCDC board acted on those activities through the 80s and 90s, even while some of the nation's biggest cities and rural areas were struggling with hard economic times. In the 90s, upon hearing the city council in Des Moines, Iowa was passing on the addition of a casino to the south side of its downtown, board President Eddy Saylor and other CCDC members decided to take on the recruitment of Lakeside Casino Resort for Clarke County. Through aggressive campaigning driven by a passion for development and progress, the deal was made to break ground for the riverboat on West Lake late in 2000 with The Development Corporation securing the gambling license. This would prove to be a "game changer" for the entire area. "The casino was a big shot in the arm for the area," said Helen Kimes, CCDC Board Member and past president. "With the county and the cities of Murray and Woodburn sharing the profits made from the boat, development opportunities in the area were given an incredible boost." Since the addition of the casino, grant opportunities through the Development Corporation have made a positive impact across Clarke County. This included updates to the Clarke County Hospital in the early 2000s, with further renovations and expansion over the last few years. Clarke County continues to benefit from the CCDC grants, allowing the hospital to provide award-winning emergency services and medical care. Community programs like Tech Prep Housing, Paint the Town Red, Safe Routes to School with miles of recreational trail expansions, Neighbors Helping Neighbors, and the support for The Village Daycare continue to improve the quality of life in Clarke County. With the addition of the E. Eddy Saylor Industrial Park for businesses like Osceola Farm and Home, Boyt Harness, Alliant Energy, and Iowa Steel, employment opportunities have increased, as have contributions to the county's tax base, keeping the vision of the original founders like Eddy Saylor moving forward. With thousands of jobs created for the county since its inception in 1969, the Clarke County Development Corporation shows no sign of slowing. Expansions for the Saylor Business Park this year as well as closing in on the development of the Clarke County Reservoir mean even more opportunities to bring business and growth to the area can be seen on the horizon. So, join the CCDC, their board, and members in celebrating this half century milestone and wish them luck for the next 50 years.